ANKARA, Turkey — The United States seems set to cut off its supply of arms to Kurdish fighters in Syria, in a move by President Donald Trump that is sure to please Turkey but further alienate Syrian Kurds who bore much of the fight against the Islamic State. In a phone call Friday with Turkish President Recep Tayyip Erdogan, Trump said he'd "given clear instructions" that the Kurds will receive no more weapons, adding that "this nonsense should have ended a long time ago," said Turkish Foreign Minister Mevlut Cavusoglu. The White House appeared to confirm the move in a cryptic statement about the phone call that said Trump had informed President Erdogan of "pending adjustments to the military support provided to our partners on the ground in Syria." The White House called the move "consistent with our previous policy" and noted the recent fall of Raqqa, once the Islamic State group's self-declared capital but recently liberated by a largely Kurdish force. The Trump administration announced in May it would start arming the Kurds in anticipation of the fight to retake the city. The move could help ease strained tensions between the U.S. and Turkey, two NATO allies that have been sharply at odds about how best to wage the fight against ISIS. Turkey considers the Kurdish Syrian fighters, known by the initials YPG, to be terrorists because of their affiliation to outlawed Kurdish rebels that have waged a decades-long insurgency in Turkey. Yet the U.S. chose to partner with the YPG in Syria anyway, arguing that the battle-hardened Kurds were the most effective fighting force available. 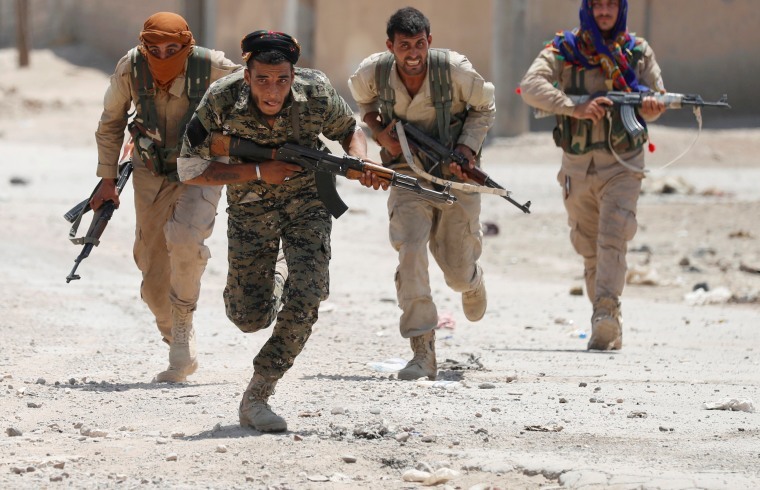 The United States has been arming the Kurds in their fight against ISIS through an umbrella group known as the Syrian Democratic Forces, or SDF, which is comprised of Kurdish as well as Arab fighters. But the retreat of ISIS, which has lost nearly all its territory in Syria, has altered the dynamics in the region and a U.S. defense official said he was unaware of any additional arms scheduled to be transferred to the Kurds, even before the Turkish announcement. As the fight against ISIS has waned in recent months, the U.S. has pledged to carefully monitor the weapons it provides the Kurds, notably ensuring that they don't wind up in the hands of Kurdish insurgents in Turkey known as the PKK. In both Syria and Iraq, the U.S. relied on Kurdish fighters to do much of the fighting against ISIS, but those efforts have yet to lead to a realization of the Kurds' broader aspirations, most notably an independent state. In May members of Erdogan's security detail were involved in a mass brawl outside the Turkish ambassador's residence in Washington. The scuffles between protesters and the bodyguards were caught on camera after Trump welcomed the Turkish president to the White House. More recently NBC reported that federal investigators are examining whether former National Security Advisor Michael Flynn met with senior Turkish officials ahead of Trump's inauguration about a potential quid pro quo in which Flynn would be paid to carry out directives from Ankara while in the White House. Investigators for Special Counsel Robert Mueller's probe into Russia's interference with the U.S. presidential election recently questioned witnesses about the alleged December 2016 meeting between Flynn and senior Turkish officials, two people knowledgeable with the interviews said. The questions were part of a line of inquiry regarding Flynn's lobbying efforts on behalf of Turkey.